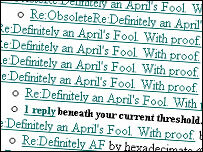 Slashdot's readers aren't easily fooled. Or are they? The first rule of public relations: check the calendar before your big product launch. Google, one of the savviest firms on the internet, has learnt this lesson the hard way after announcing it was taking a leap into the e-mail market. Thanks to the date on its press release - 1 April - most of its target market was convinced the launch was a hoax. Despite the firm's reassurances, online message boards have been full of speculation about Google's Gmail. "It's going to go down in history as one of the biggest pranks ever pulled," wrote one visitor to Slashdot.org, a major talking shop for tech workers. Google's insistence that Gmail was genuine was undermined by the oddly jokey style of its initial announcement. A Google user, the release said, "kvetched like crazy" about existing web e-mail programs. "Millions of M&Ms later, Gmail was born." The company has a reputation for unconventional humour, and did publish a genuine April Fool's joke - a fake advertisement for engineers to work on the moon. "It is April Fool's Day. We were having fun with this announcement," said Jonathan Rosenberg, Google's vice-president of products. "We are very serious about Gmail."